Note: This is NOT the official way to sign an application. This is just a quick hack to help my friend getting an application running on his phone. Go to Symbian Signed for more details on signing an application properly. Once you submitted your request, go to "我的证书" and wait for your certificate and key files. It could take several hours or even a day for the files to be ready. 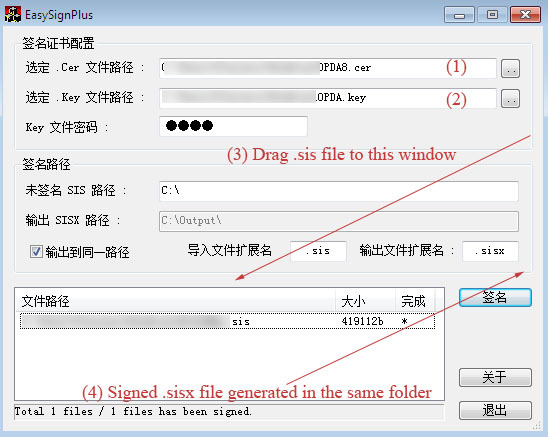 Once it said "已完成", click on "普通下载" to download both the .cer and .key files. Keep them in a safe place. You will need them to sign your applications. Next, get hold of a Windows application called EasySignPlus. Please don't ask me where to get it. You can easily search for it on the Internet. Install the .sisx file in your phone as usual and have fun~!